When Eden Hazard said in the summer that "it might be time to discover something different", the alarm bells were ringing at Chelsea. After six seasons, two Premier League titles, and countless mazy dribbles, was it time for Chelsea's star player to become a galactico? Not yet. And if Hazard desperately wanted the move to Real Madrid, he is not showing it with his displays on the pitch so far this season. Maybe the arrival of Sarri at Chelsea is enough of "something different" for him. Hazard didn't start Chelsea's first Premier League game of the season against Huddersfield, having only recently returned from the World Cup, but looked bright after coming off the bench and set up the third goal for Pedro. He was again a substitute in the 3-2 win over Arsenal, but has started Chelsea's last two games - against Newcastle and Bournemouth - and has made decisive impacts. "You take him out of the team and I think they would struggle," said Paul Merson on Soccer Saturday after Hazard scored in a 2-0 win over Bournemouth this weekend. "Chelsea have good players but everything goes through Hazard. They give him the ball and wait for him to do something. "He would make a difference to Real Madrid and make them a much better team. Chelsea must be breathing a big sigh of relief that he is still there." Hazard was given freedom to roam by Sarri against Newcastle and responded with a man-of-the-match display and a goal, despite being targeted for some rough treatment. Against Bournemouth this weekend he was again influential. As at St James' Park, Chelsea were faced with the task of breaking down a stubborn defence, with Bournemouth's back three actually a back five for most of the match. That left little space for Chelsea to work with, but Hazard continued to create room with his electric changes of pace and clever turns. He mainly operated down the left side of the pitch but also drifted inside and out to the right. His five key passes were more than any other player and he could have had a couple of assists after teeing up Marcos Alonso either side of half-time. After threatening in and around the box all game, he did make a telling impact in the 85th minute when he collected Alonso's lay-off and drilled a low shot past Asmir Begovic with his weaker left foot. "I have confidence and I'm enjoying playing," he told Sky Sports afterwards. "We have a lot of good players, a new manager, everything is going well." Even though he has only started two of four matches, he's got two goals, two assists. And Belgium manager Roberto Martinez said this week that he thinks Sarri's arrival at Chelsea could bring the best out of Hazard. "After such a World Cup, it was certainly a good time for Eden Hazard to take up a new challenge. Sarri's arrival is good for Eden. He is ready for the new challenge and the new manager at Chelsea." One concern for Sarri might be that Hazard's lively display did not result in chances for Alvaro Morata. The striker only had five touches in the penalty box and did not have as much impact in 60 minutes as his replacement Olivier Giroud had in 30 minutes. That might tempt Sarri to hand Giroud opportunities to start, or maybe to try Hazard in a central role with Willian and Pedro either side. That worked with Dries Mertens at Napoli, but Hazard has previously been frustrated playing as a 'false nine' and Belgium manager Martinez has said it is not his best position. 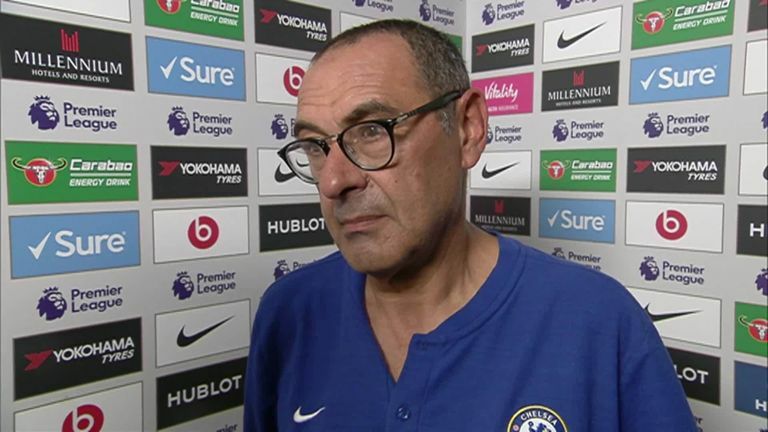 Sarri has said that Chelsea can still improve even after winning their opening four games of the season but, despite Morata's struggles, he might be reluctant to move Hazard and affect the balance of the team. Instead, Sarri might be best leaving Hazard to roam free and see if he can build on this strong start.